To Cite: Taghizadeh Kermani A, Ghorbani H, Gharib M, Gharibdoost Z, Javadinia S A. Unilateral Renal Primitive Neuroectodermal Tumor (PNET), Int J Cancer Manag. 2017 ; 10(10):e7409. doi: 10.5812/ijcm.7409. Introduction: Primitive neuroectodermal tumor (PNET) of kidney is a rare clinical condition. We report a young girl with PNET of kidney. Case Presentation: A 14-year-old female presented with chronic flank pain. Imaging studies revealed a huge renal mass with left renal vein thrombosis. Histopathological findings were consistent with PNET, which was later confirmed by immunohistochemistry and she received adjuvant chemotherapy. Conclusions: PNET is a rare clinical condition in urology and it should be considered in young patients with a renal mass, especially when it is huge. Treatment plan includes radical nephrectomy along with neoadjuvant chemotherapy. Tumors classified as primitive neuroectodermal tumor (PNET) are included in small round cell tumors family; they usually arise from bones. Extra skeletal PNETs, especially those of kidney, are very rare. They usually affect adolescences and young adults and should be considered in the differential diagnoses of those tumors happening in younger age such as Wilm’s tumor (1, 2). These tumors generally affect males more than females. The 5-year disease free survival for extra skeletal PNETs is about 45% to 55%. Renal PNETs are more aggressive and often metastasize early to the lymph nodes, lungs, liver, and bones (3-5). We report a case of PNET of kidney in a young girl along with her clinical presentation and pathologic and radiological findings. A 14-year-old girl with no specific pervious/familial medical history was referred to the department of urology because of chronic flank pain in the left side. Clinical examination revealed a huge, round, palpable mass in the left flank. There were not any other signs and symptoms. Patient underwent medical investigations for abdominal mass by ultrasonographic imaging and computed tomography scan (CT scan). Ultrasonographic imaging showed an enlarged kidney (172*80 mm) with a huge heterogeneous mass (110*85 mm) that in the middle part of the lesion, there was a varicose vein with internal hypo-echoes, suggesting venous thrombosis. A spiral CT scan with oral and intravenous contrast also showed a huge solid mass (158*92*83 mm) in the left kidney (Figure 1). Figure 1. 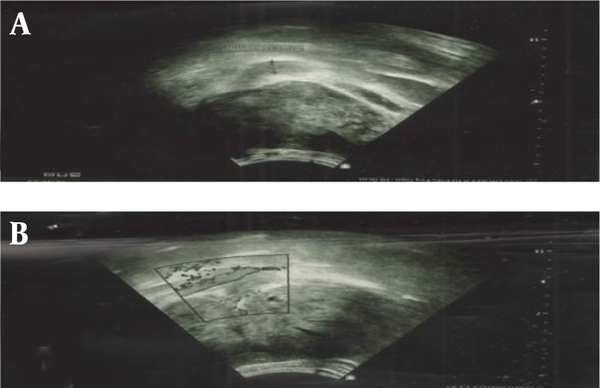 Contrast-Enhanced Computed Tomography Image of the Abdomen; A, Axial image reveals a solid large mass of heterogeneous attenuation in the left kidney; B, Coronal image shows a large mass of heterogeneous attenuation in the left kidney. Based on these paraclinical data, neoplastic lesions, such as renal cell carcinoma were highly suggestive. With this assumption, patient underwent abdominal Doppler sonography and High-resolution computed tomography (HRCT) of thorax. Doppler sonography showed high resistance renal vessel flow in the left main renal vein measuring 11 mm with internal echo (suggesting venous thrombosis). HRCT of thorax showed multiple sub-pleural nodules in both lungs, which was suggestive for metastases. Patient underwent laparotomy and CT guided core needle biopsy (CNB) of pulmonary nodules. Surgical observations revealed that right renal artery was crossing anteriorly to inferior vena cava, left renal vein, and its thrombotic site. Right renal artery was dissected and meticulously separated from the vein and, then, right radical nephrectomy was performed. 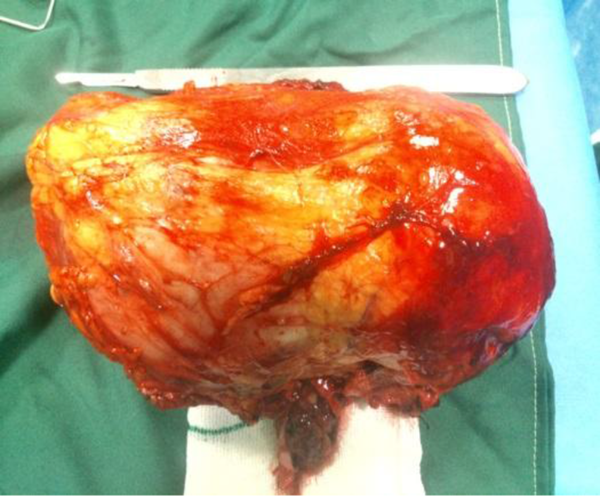 There was no gross lymph node; however, regional lymphadenectomy was performed. All tissues were sent to pathology department for further evaluations (Figure 2). Grossly, in histopathological examination, the tumoral kidney was measured 17*10*8.5 mm and weighted 780 g. Sectioning revealed that almost the entire kidney was infiltrated by a multi-nodular mass with cystic formations containing blood clots and necrotic material, which extended from the renal cortex to the renal pelvis. Histopathologic examination revealed sheets of small blue round cells with round nuclei, fine chromatin, and scant clear to slightly eosinophilic cytoplasm with numerous mitotic figures (Figures 3 and 4). Immunostaining for myogenin, desmin, CD45, and other lymphoid markers were negative; however, strong immunoreactivity for CD99 (O13, MIC2) was seen (Figure 5). These data are consistent with the diagnosis of PNET. Small round blue cell differential diagnoses include Neuroblastoma, which is negative for CD99 and usually occurs at younger ages; Alveolar rhabdomyosarcoma may be CD99 positive but are strongly positive for myogenin and desmin; Lymphoblastic lymphoma, which although may be CD99 positive, stain for lymphoid markers, such as CD79a and TdT; and blastemal Wilm’s tumor does not label for CD99. Pathologic report of pulmonary CNB was non-tumoral tissues. Figure 4. Histopathological Examination; A) Intrarenal tumor consists of solid sheets with intervening fibrous strands (H&E, 40 ×); B, high power shows a relatively monotonous small round blue cells with round and indented hyperchromatic nuclei with fine chromatin and little syncytial-like cytoplasm. ( H&E, 400 ×). The patient was referred to the department of radiation and clinical oncology and was given post-operative adjuvant chemotherapy of alternative VAC (Vincristine, Adriamycin, and Cyclophosphamide) and IE (ifosfamide and ethoposide) for 4 cycles each. There was no tumor recurrence at 1 year follow-up. An informed consent was obtained from the patient and her legal guardian. PNET is a poorly differentiated neoplasm with neuroectodermal origin, which is an extremely rare clinical condition, first described in the 1990’s. Since then, most features of this neoplasm have been presented through case reports and there are few original articles in this context (6-8). Based on the literature reviewed, less than 100 cases of PNET of kidney have been reported to date. However, the presence of venous thrombosis is not very common in this rare condition. This neoplasm mostly occurs in young males aged between 13 and 18 years (4, 6). In a review conducted by Kuroda et al. (2000) and Thyavihally et al. (2008) the average age at diagnosis was 27.7 and 27 years, respectively (9, 10). The most common clinical presentation is a vague pain in the flank. Imaging findings, such as huge renal mass (more than 10 cm in diameter) is prevalent (6, 7, 11). As the tumor is highly aggressive, it is often diagnosed at an advanced stage with distant metastasis, with lung being one of the most common sites (4, 12, 13). However, some studies, such as Thyavihally et al. (2008) showed that patients mostly had localized disease at presentation (10). Final diagnosis was peripheral neuroectodermal tumor (PNET), confirmed by histopathological and immunohistochemical studies of the nephrectomy specimen, revealing a small blue round cell tumor with diffuse membranous positivity for CD99 (14). The differential diagnosis of renal small round blue cell tumor includes Neuroblastoma, Alveolar rhabdomyosarcoma, Lymphoblastic lymphoma, and blastemal Wilm’s tumor (15). These tumors are high grade and their characterization without immunohistochemistry is often difficult. Therefore, Immunohistochemical examination is necessary for the diagnosis of these tumors (10). Strong immunoreactivity for CD99 (O13, MIC2) is the main guide for the diagnosis of PNET; however, Homer-Wright-type rosettes are a typical histologic feature for it. Treatment includes surgery plus chemotherapy and radiation in case of residual disease. Radical nephrectomy ± post-operative chemotherapy is the procedure of choice in case of localized disease, which has shown the survival advantage (10). Because of the biologic similarities with Ewing’s sarcoma, PNET is treated with similar chemotherapy regimens, consisting of vincristine (V), dactinomycin (D), adriamycin (A), cyclophosphamide (C), ifosfamide (I), and etoposide (E) [VAC-IE] (10). PNET is a rare disease of genitourinary system, which should be considered in young patients who are suspicious for renal tumors, especially if imaging shows a huge renal mass with venous thrombosis. The differential diagnoses include extraosseous Ewing’s sarcoma/PNET, rhabdomyosarcoma, Wilm’s tumor, lymphoblastic lymphoma, Neuroblastoma, and small cell variant of osteosarcoma. Treatment is radical nephrectomy along with adjuvant chemotherapy. 1. Gonlusen G, Ergin M, Paydas S, Bolat FA. Primitive neuroectodermal tumor of the kidney: a rare entity. Int Urol Nephrol. 2001;33(3):449-51. [PubMed: 12230269]. 2. Citak EC, Oguz A, Karadeniz C, Okur A, Akyurek N. Primitive neuroectodermal tumor of the kidney in a child. Pediatr Hematol Oncol. 2009;26(7):481-6. [PubMed: 19863203]. 3. Asiri M, Al Sayyad A. Renal primitive neuroectodermal tumour in childhood: Case report and review of literature. Can Urol Assoc J. 2010;4(6):158-60. [PubMed: 21749811]. 4. Rodriguez-Galindo C, Marina NM, Fletcher BD, Parham DM, Bodner SM, Meyer WH. Is primitive neuroectodermal tumor of the kidney a distinct entity?. Cancer. 1997;79(11):2243-50. [PubMed: 9179073]. 5. Seemayer TA, Thelmo WL, Bolande RP, Wiglesworth FW. Peripheral neuroectodermal tumors. Perspect Pediatr Pathol. 1975;2:151-72. [PubMed: 1129029]. 6. Aghili M, Rafiei E, Mojahed M, Zare M. Renal primitive neuroectodermal tumor: does age at diagnosis impact outcomes?. Rare Tumors. 2012;4(1):15. doi: 10.4081/rt.2012.e15. [PubMed: 22532913]. 7. Patnaik N, Mishra K, Saini P, Agarwal N. Primitive neuroectodermal tumor of the kidney in a young male: Case report and review of literature. Urol Ann. 2015;7(2):236-9. doi: 10.4103/0974-7796.150537. [PubMed: 25836041]. 8. Torga G, Barrow W, Han M. Rare Renal Incidentaloma in Pregnancy: An Unusual Primitive Neuroectodermal Tumor Presentation. Urol Case Rep. 2015;3(2):12-4. doi: 10.1016/j.eucr.2014.12.004. [PubMed: 26793487]. 9. Kuroda M, Urano M, Abe M, Mizoguchi Y, Horibe Y, Murakami M, et al. Primary primitive neuroectodermal tumor of the kidney. Pathol Int. 2000;50(12):967-72. [PubMed: 11123763]. 10. Thyavihally YB, Tongaonkar HB, Gupta S, Kurkure PA, Amare P, Muckaden MA, et al. Primitive neuroectodermal tumor of the kidney: a single institute series of 16 patients. Urology. 2008;71(2):292-6. doi: 10.1016/j.urology.2007.09.051. [PubMed: 18308106]. 11. De Visschere P, De Potter A, Claus F, Mulkens T, Oyen R, Verbaeys A, et al. PNET/Ewing's sarcoma of the kidney: imaging findings in two cases. JBR-BTR. 2013;96(2):75-7. [PubMed: 23847825]. 12. Karpate A, Menon S, Basak R, Yuvaraja TB, Tongaonkar HB, Desai SB. Ewing sarcoma/primitive neuroectodermal tumor of the kidney: clinicopathologic analysis of 34 cases. Ann Diagn Pathol. 2012;16(4):267-74. doi: 10.1016/j.anndiagpath.2011.07.011. [PubMed: 22534242]. 13. Sun C, Du Z, Tong S, Xu K, Ding W, Sun J, et al. Primitive neuroectodermal tumor of the kidney: case report and review of literature. World J Surg Oncol. 2012;10:279. doi: 10.1186/1477-7819-10-279. [PubMed: 23270507]. 14. Ellison DA, Parham DM, Bridge J, Beckwith JB. Immunohistochemistry of primary malignant neuroepithelial tumors of the kidney: a potential source of confusion? A study of 30 cases from the National Wilms Tumor Study Pathology Center. Hum Pathol. 2007;38(2):205-11. doi: 10.1016/j.humpath.2006.08.026. [PubMed: 17134738]. 15. Friedrichs N, Vorreuther R, Poremba C, Schafer KL, Bocking A, Buettner R, et al. Primitive neuroectodermal tumor (PNET) in the differential diagnosis of malignant kidney tumors. Pathol Res Pract. 2002;198(8):563-9. doi: 10.1078/0344-0338-00303. [PubMed: 12390000].